With the announcement of the death of Pope John Paul II in April of 2005, the process began to select the 264th successor to St. Peter (in accordance with Catholic tradition). On Monday, April 18th 2005, after the official 9 days of prayer and mourning, 115 cardinals, from 52 countries and five continents, began the process of deliberation. Later that evening the Cardinals cast their first vote. This single ballot did not result in an election, and therefore the ballots were burned in a small stove at 8:04 p.m. Monday evening (2:04 EST) along with chemicals to colour the smoke black. "Dear brothers and sisters. I announce to you a great joy. We have a Pope. The Most Eminent and Most Reverend Lord, Lord Joseph, Cardinal of Holy Roman Church, Ratzinger, who has taken the name Benedict XVI." This process of election of the pope by a select group of cardinals has been around in its current form (more or less) for about 1000 years. Before that things were a lot less organized, and the disputes about who was and wasn't pope were numerous and often violent. Let me tell you about one such case. When Bishop Liberius of Rome died in September of 366, there was no prescribed system for selecting a new pope, in fact they weren't even called popes at that time. Liberius had grown in popularity largely because of his stand resisting the heresy known as Arianism, a theology that denied the divinity of Christ. He was even exiled for a time when Rome came under the control of Felix II (regarded as an anti-pope ) who was sympathetic to the Arian cause. However, Liberius had many supporters, commoner and senator alike, who agitated for his return, and eventually Emperor Constantinius restored Liberius to his position after he agreed to be lenient with the Arians. This caused Bishop Hilary of Poiters to declare "A curse on you, Liberius." Shortly after that, Liberius died! Though there was no formal process for selecting a new Bishop of Rome, there was a election of sorts. All the citizens of Rome, laity and clergy, were able to make their voice heard, and by a large majority, Rome chose Damasus, a sixty-year-old deacon, to be their next bishop. He was consecrated by three other bishops, including the Bishop of Ostia, as was declared the official ordainer of the Bishop of Rome by Bishop St. Mark thirty years earlier. So by all accounts Damasus was the properly chosen successor to Liberius. There was a problem however; remember Felix II, sympathetic supporter of the Arian Heresy? Well, Damasus was one of his bishops, and some followers of Liberius were unhappy to see a man who once worked for Felix sitting in Liberius' chair, so to speak. They chose their own bishop, a fellow by the name of Ursinus and had an old Bishop from Tibur consecrate him as the new Bishop of Rome. Well, Damasus, and those who endorsed him, appealed to Juventius, then Prefect of Rome (chief city official), to deal with what they viewed as an usurper. The Prefect ordered Ursinus to leave Rome, which he did; but his followers did not give up that easily. They took up arms and proceeded to try and force Damasus to give up the bishop's pallium (emblem of authority). Damasus gathered a number of his own men, armed them and launched a counter-attack on his rival's forces, who had taken refuge in the Liberian Basilica (a Roman church later renamed St. Mary Major). A three-day battle followed. The supporters of Damasus eventually assaulted the building by climbing onto the roof, where they tore aside the heavy roof tiles, and having made an opening, then dropped the heavy tiles onto the men trapped below. When the smoke cleared, (pun intended) Damasus had won the day, but with a heavy price - one hundred and thirty seven followers of Ursinus lay dead on the floor of the church. And yet, the battle was not over; in the days that followed Damasus would hire a number of gladiators to be his bodyguards due to repeated attacks in the streets. When violence proved unsuccessful, his opponents attempted to overthrow him by making accusations of serious sin. What they were is not entirely clear, but eventually the emperor felt compelled to intervene and cleared Damasus of the charges. But the arguments and opposition continued. A full 11 years later, in 378, and again 3 years after that in 381, councils held in Rome and Aquileia both declared that Damasus was the true bishop. The irony is, Damasus was never a true supporter of Felix II. He worked for him, but did not share his views regarding the Arian Heresy, as was borne out when the trouble eventually did simmer down and he was able to finally get around to the duties of being Bishop of Rome. He proved himself an enemy of the Arian heresy, putting a number of Arian bishops out of the church. He also issued twenty-four anathemas (curses) against false teachings about the Trinity and Jesus Christ. Despite the violence associated with his election, Damasus was to become highly regarded by other Christian leaders of his day. A large part of the reason for this is Damasus proved to be a great promoter of martyrs. He restored many of their tombs, rebuilt their churches, and wrote poems about saints who had died because of their testimony for Christ. You may be wondering why have I chosen to write about Damasus? There were plenty of popes who ascended to the papal see by unusual and violent means. Why choose him? Well, one of the most fascinating things for me about Christian history is the story of how we got our Bible. And Damasus plays an important role in that process. Damasus was the first pope to issue an official list of the books which should be included in the Bible. He also persuaded his friend and secretary, Jerome, to make a new Latin translation of the Bible, using this list. Jerome did so, and his translation would become known as the Vulgate, the Bible of the Middle Ages. It was the Bible that priests, teachers, bishops, monks, and other scholars would use for much of the next one thousand years. The three day battle, that would end with a victorious Damasus, without which the Vulgate might never have come into being, was won on October 26, 366 - one thousand, six hundred forty one years ago this week. 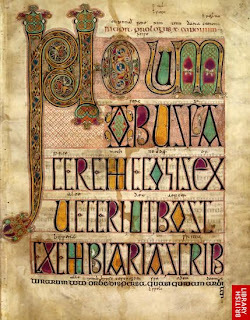 Photo: Page 2 of the Lindisfarne Gospels, Letter from Jerome to Pope Damasus I dedicating the translation of the Vulgate. 1. Thomas J. Shahan. "Pope St. Damasus I", The Catholic Encyclopedia, Volume IV. Published 1908. New York: Robert Appleton Company. 2. "Damasus I Saint." Encyclopædia Britannica. 2007. Encyclopædia Britannica Online. 23 Oct. 2007 <http://www.britannica.com/eb/article-9028639>. 3. "Ursinus." Encyclopædia Britannica. 2007. Encyclopædia Britannica Online. 23 Oct. 2007 <http://www.britannica.com/eb/article-9074497>. October 22, 1844: Somewhere between 50,000 and 100,000 followers of Baptist lay preacher William Miller gathered in makeshift temples and on hillsides to "meet the bridegroom' on the "The Day of Atonement"—the day Jesus would return. Jesus didn't, and though Miller retained his faith in Christ's imminent return until his death, he blamed human mistakes in Bible chronologies for "The Great Disappointment." Several groups arose from Miller's following, including the Seventh-Day Adventists. October 24, 1648: The Peace of Westphalia, after being delayed by Richelieu for 13 years, is finally signed and ends central Europe's Thirty Years War. The documents extended equal political rights to Catholics and Protestants (including religious minorities), and marked the first use of the term "secularization" in regard to church property that was to be distributed among the warring parties. October 25, 1890: Emma Whittemore, New York socialite and her husband Sydney, millionaire businessman, open the first 'Door of Hope' home for young women in New York City. The Whittemores encountered the emptiness of their lives on a visit to a street mission run by an ex-convict. they came away "with a holy determination, born of God himself, to henceforth live for his glory and praise. Within four years the home help 325 girls, by Emma's death in 1931 there were 97 homes in seven countries. October 27, 1978: After 13 years work by over one hundred scholars from the United States, Great Britain, Canada, Australia and New Zealand, the complete New International Version (NIV) of the Bible is published for the first time. October 28, 312: According to tradition, on this date the 32-year-old Roman emperor Constantine defeated Maxentius at Milvian Bridge. Before the battle, Constantine had seen the symbol of Jesus, chi-rho, in a vision, accompanied with the words "By this sign conquer." He considered this a sign and emblazoned the symbol on his shield and banners before the battle. Regarded as Rome's first Christian emperor he honured Christian bishops and meddled in church affairs the rest of his life. He received his baptism on his deathbed in 337. Don't Beat Yourself Up Over It.